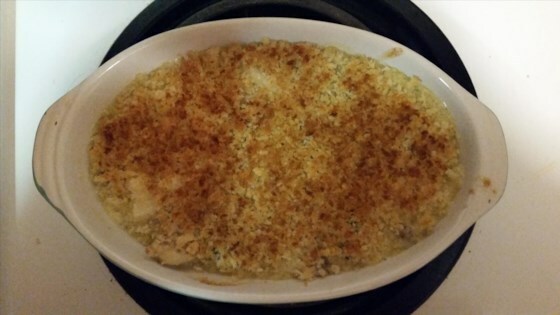 "This is a great elegant dish for a dinner party and can be made ahead...DELICIOUS!" In small mixing bowl, toss the bread crumbs with 1 tablespoon of melted butter; mix thoroughly and set aside. In another small bowl, combine the cheese, mayonnaise, wine and parsley; mix thoroughly and set aside. In a skillet over medium heat, saute scallops in 2 tablespoons of melted butter until opaque. Transfer to a plate lined with paper towels. Preheat broiler for medium/high heat. Reheat the skillet over medium heat and cook the mushrooms and onion in 2 tablespoons of melted butter until tender. Add cheese mixture and return the scallops to the skillet. Cook until heated through and the cheese is melted. Spoon the mixture into individual ramekins or pour the whole mixture into a 11x7 inch baking dish. Sprinkle the top with bread crumb mixture. The mayo taste can be overpowering. I substitute half the mayonnaise with a heavy cream or cream cheese and it is delicious. We serve it often. I found the mayonnaise taste overwhelmed everything else in this recipe. Not something we will make again.